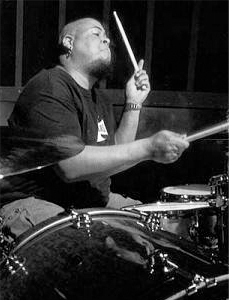 Spectrasonics Artisans - Abe Laboriel Jr.
Abe Laboriel Jr. has been banging on objects since before he could walk. He claims that his many failed attempts at melodic instruments have given him an affinity for the simpler arts, such as cooking and drumming. After a lifetime of learning and absorbing the artistry of some of the world's most respected musicians (including mentors Jeff Porcaro, Chester Thompson and Alex Acuña, as well as his "Bass Legend" father), Abe Jr. has truly come into his own aggressive and commanding style. Today, Abe Jr. is one of the most highly sought after session drummers in the world. Abe's amazing power has been heard live and on hundreds of hit recordings with artists such as Paul McCartney, Lady GaGa, Sting, B.B. King, Kelly Clarkson, Eric Clapton, Seal, Melissa Etheridge, Me'shell Ndegeocello, k.d. lang, Scritti Politti, Steve Vai, Duran Duran, Jewel, Ringo Starr, Natalie Cole, Patti Austin, Imogen Heap, Jeff Beck, Krystal, Manhattan Transfer, Ashlee Simpson, Mylène Farmer, Les Paul, Dianne Reeves, Joe Sample, LeAnn Rimes and Steve Winwood to name a few. More about Abe Laboriel Jr.